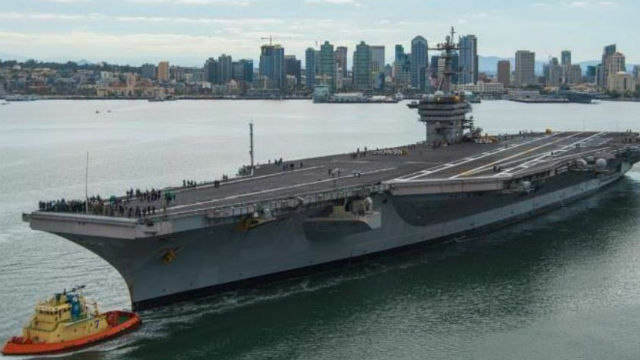 San Diego will lose the iconic USS Carl Vinson aircraft carrier while gaining another Nimitz-class flattop, the USS Abraham Lincoln, the Navy announced Thursday. Commissioned in 1989, the Abraham Lincoln previously served in the Pacific Fleet from 1990 to 2011 before moving to Norfolk for midlife refueling. Citing operational security, a Navy spokesman said he couldn’t say whether the Vinson will return first to San Diego or head straight to Bremerton, reportedly in early 2019. “Sailors on Carl Vinson who have a certain amount of time left on their contract will have the … option of bringing their families [to Bremerton] or not,” said the spokesman, Cmdr. Ron Flanders of North Island-based Naval Air Forces. At sea, the Vinson has a crew of about 5,500, he said. But only 3,000 are San Diego-based. Some squadrons are based in Lemoore, Point Mugu and even Whidbey Island, Washington. Flanders said three squadrons based in Coronado won’t be moved to Washington state. The other two carrier shifts are tied to carrier maintenance, said North Island Naval Air Station in Coronado. The USS John C. Stennis, currently home-ported in Bremerton, Washington, will change homeports to Norfolk in advance of its midlife refueling, or reactor complex overhaul, at Newport News Shipbuilding. The Stennis was commissioned in 1995; Nimitz-class carriers are built to last 50 years. The Carl Vinson will conduct a homeport change to Bremerton in advance of its docking-planned incremental availability at Puget Sound Naval Shipyard, the Navy said. The Vinson joined the Ronald Reagan and Nimitz at North Island in early 2010. The Bremerton-based Kitsap Sun newspaper earlier Thursday reported that the Vinson was due to arrive at the Washington port sometime early next year. “The Vinson is scheduled to receive more than a year of dry-dock maintenance at [Puget Sound] starting in March 2019 and running through until July 2020, according to the Navy’s fiscal year 2019 budget,” the paper said. On Monday, military.com reported that the 5,500-crew member Vinson sent two MH-60 Sea Hawk helicopters to rescue five people from a 35-foot boat that ran aground Friday in shallow waters on the northern side of Niihau. The “Black Knights” copters of Helicopter Sea Combat Squadron 4 took four people to a Coast Guard facility on Kauai, while a fifth person was flown to a medical facility for evaluation, the Navy was quoted as saying. The Vinson had been taking part in the 25-nation Rim of the Pacific exercises, also known as RIMPAC. The exercises ended Thursday. The carrier supports 70 aircraft from Carrier Air Wing 2 and also serves as the flagship for commander, Carrier Strike Group 1. During its servicing, the Vinson will be pulled out of water in dry dock. Puget Sound is the only shipyard on the West Coast with this carrier capability, Flanders said. It isn’t known whether the Vinson would eventually return to San Diego, since Navy planners base home-porting on world events. “Once she leaves San Diego and goes to Bremerton, that will be her homeport indefinitely, for the time being,” Flanders said. The Vinson’s commanding officer, Capt. Matthew Paradise — who took over from Rear Adm. Doug Verissimo on June 11 — will be making a homecoming of sorts. His roots are in the Northwest — he has an electrical engineering degree from the University of Washington. “Paradise enlisted in the Navy in 1985 and attended Basic Underwater Demolition School,” said a Navy bio. “While assigned to SEAL Team 2, he was selected for the Enlisted Commissioning Program and earned his commission in 1992.